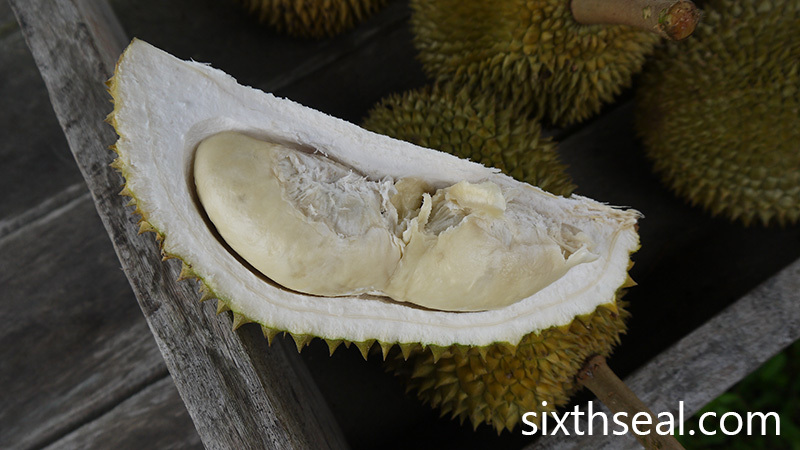 Sarawak (or at least Borneo) is said to be the home of the largest variety of durians in the world. My better half came to visit with the kids and her parents and I drove them to the rural town of Bintangor. We had just seen durians in the local Sibu market the morning before and I expected a few homegrown stalls to be selling the wonderful fruit. 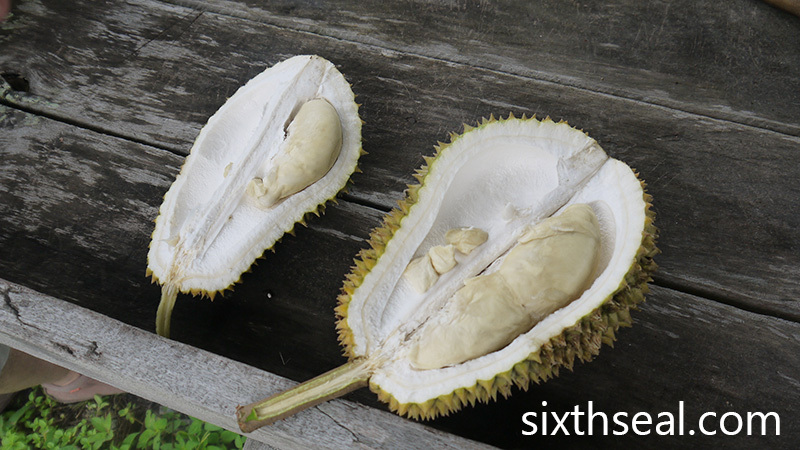 I wasn’t disappointed – one wooden structure on the road leading to Bintangor had a few cars pulled up and browsing the durians on offer. Her dad (who is also a passionate durian lover like me) wanted to see what the local durians were like so we also joined the fray. This man was literally selling durians out from his van. 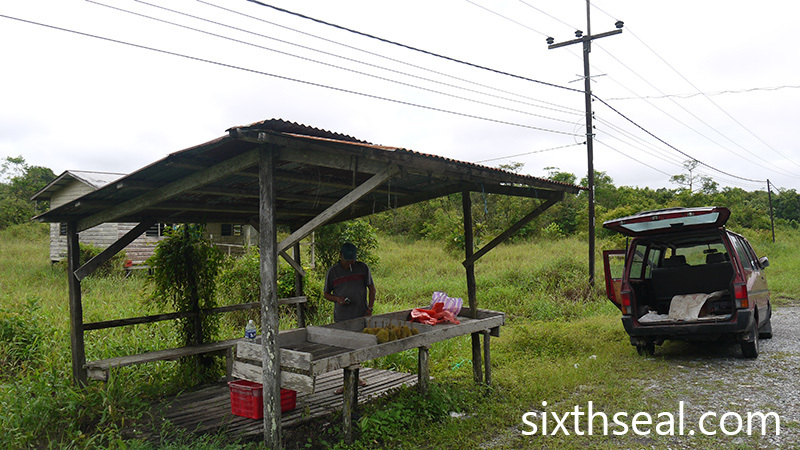 He’s local and says the durian trees were grown by his father. 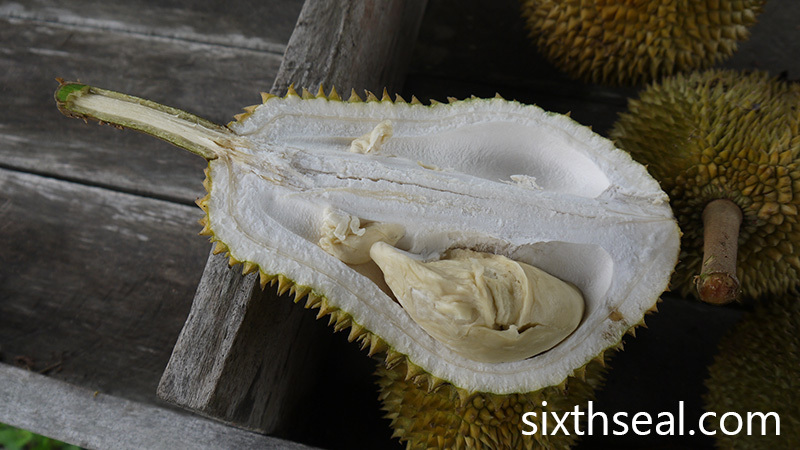 He looks to be in his early 40’s so that says a lot about the age of the durian trees – it’s a lot more mature than most of the cultivars you get in Peninsula Malaysia. The price was RM 100 for 10 durians or RM 15/durian, which is slightly more expensive than the prices we get in KL. 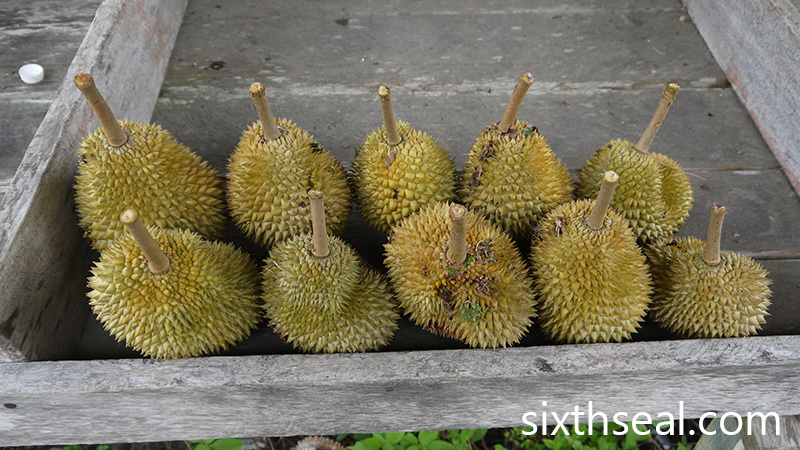 Keep in mind that these are local Borneo durian species instead of special cultivars and no one really knows what the species is but it tastes quite good. 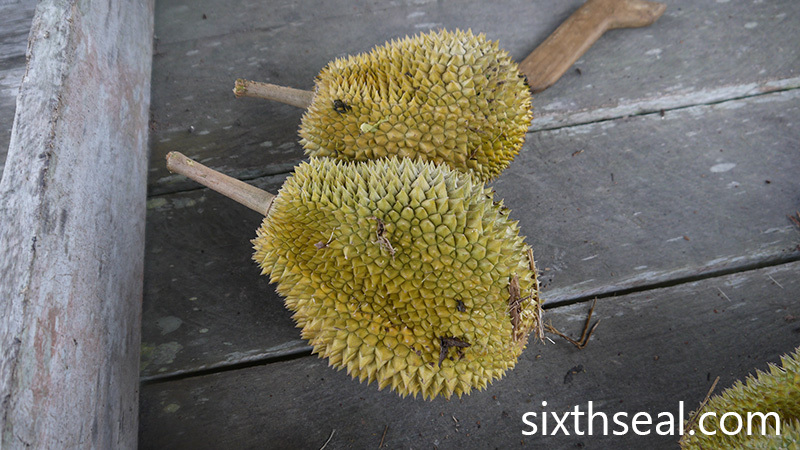 The walls of the fruit was thick and the stem is relatively long and slim like a D158/Ganyao durian. It had the characteristic frayed look of a durian that dropped naturally too. The flesh is creamy and sweet with almost no bitter notes. Significantly, the odor wasn’t very strong too, but that didn’t affect the taste much. The small fruits bore about 7-8 seeds which we all shared. My dear loved the durian coz it didn’t have much fiber, unlike some cultivars like D2 durian. My better half took this photo of us – she didn’t want her parents to appear on the blog so she asked me to put in her head instead. Haha. I forgot to take a photo with her inside coz my hands were dirty. It turns out that this was the *only* durian stall around so it’s a good thing we managed to try some during the bridge season. I’ll be back! 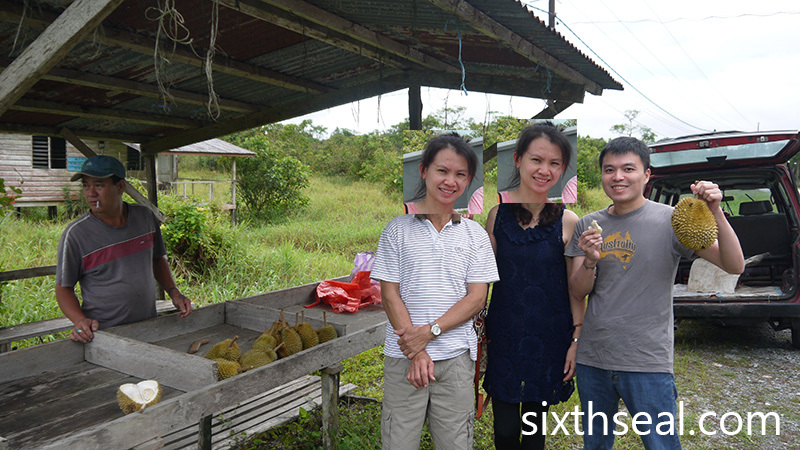 Nice durian feast for your wifey and her parents. I bet our Borneo durians tasted better and different fro others. Long time I did not eat durian. Used to eat a lot as kids but maybe outgrown it. Now I no longer crave for the fruits, it has been years since I tasted one, probably last time was in Kapit. My dear loved the taste, she usually doesn’t like the durians I get unless it’s D101 or D24 or another cultivar with little to no fibre. The durians we get over here are a lot more varied, not just durio zibethinus so it’s a lot more interesting. I love durians, have eaten them since I was a kid, still love them. It’s the season in Bintangor/Sarikei area now, I believe the Kapit season is later or earlier. They quite liked it too, her dad brought a bottle of their rojak sauce back. We were just passing through on the way to Sarikei, saw some durians on the way to Bintangor, wanted to find the ferry to go over but couldn’t find where the departure point was even though I could see the ferry so we drove to Sarikei instead. There was a reason we didn’t tell you. Her parents came to see and talk to my dad. That was the point of the visit. We weren’t aware that you knew her parents. Haha. We didn’t have time anyway, dinners on both nights were scheduled to be with my dad, her parents wanted to come over to the house. I would like this durian as well because I also prefer the flesh not to have too much fibers. I personally like all kinds, even the ones with fibre. 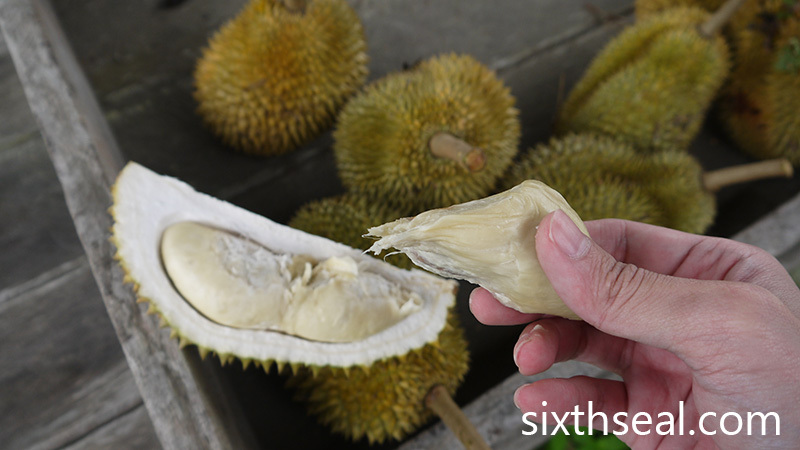 I like bitter and sweet ones, there’s no durian that I’ve tried that I haven’t liked (yet). I don’t think I’ll find a durian I don’t like since I enjoy all types of durians but my better half is a bit more selective since she doesn’t like fibrous durians. 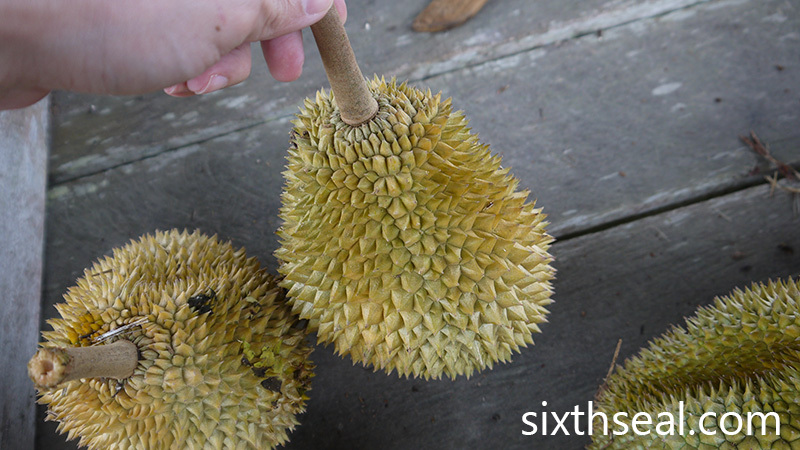 wow…still got durians now ? I really like the spike on these ones, it’s different! Very close together. But I think it is still just D. zibethinus, kampung style. Still, looks tastier than the durian I just bought in the US! At this time of the year, any durian is good for me. Sobs! You are making me crave for durians now. Hmm.. where to find good ones..